10:45 am—grease lower half of Solar Hot Pot with butter, cover, set up facing the sun (to preheat), set timer for 15 minutes. 11:00 am—pour batter into Hot Pot, cover, set timer for 60 minutes. Get chocolate chips out. Eat a few. Go look at Hot Pot curiously. 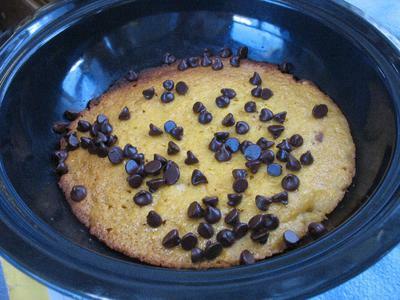 12:00 pm—quickly throw in a couple handfuls of chocolate chips, cover, adjust to sun. I was about 15 minutes late throwing the chocolate chips in; I was going to let them sink into the batter a little , but the cake was already set! I put the chocolate chips in to melt on top (they’ll taste great anyway). 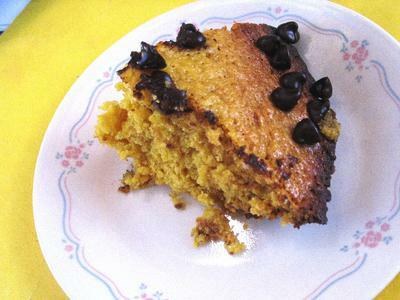 The top of the cake is browning a little bit; looks YUMMY! If yours is not done, check every 20 minutes or so. If browning unevenly like mine was, turn Hot Pot 180 degrees (Hot Pot only, not reflective panels). I let mine go a little while longer to stay warm during lunch and melt the chips. Serve with glasses of ice-cold milk. Hot Pots are on deck for mushroom burgers and glazed carrots tonight! I’ll put that in a separate post.